What happens when 17 software engineers come together for a getaway at Snowbird Resort in Utah? They establish the agile methodology. Back in 2001, after a decade of palpable growing pains and the need for a new framework for software project management, the Agile Manifesto ushered in a new era of efficiency. It favored working software over documentation, customer involvement, continuous development, and quick response to change. The basic agile values has since inspired several sub-frameworks, including the agile Scrum methodology. Scrum is the most widely used subset of agile methodology, and it has quickly evolved to address large, complicated projects that would otherwise take far too long to complete. Teams break their work into actions that they can complete within two-week cycles called “sprints.” At the end of each sprint, the team should have produced working software that they can continue to improve. If you're looking at ways to improve efficiency in your organization, ask yourself the following questions to figure out if the agile Scrum methodology will work for you. 1. Who will fill the role of Scrum Master on your team? Agile Scrum requires full commitment and understanding from every single member of your team. Beyond that, though, at least one project manager must take responsibility for implementing agile Scrum throughout each project’s lifespan as the Scrum Master. Many project managers choose to complete a Scrum Master Certificate to ensure they fully understand the parameters of this methodology before trying to implement it. Reworking your team’s process is a full-time job in and of itself. If your team cuts corners or doesn’t have someone willing to own a new process—especially in the beginning—you likely won’t see positive results. For a more in-depth look at Scrum as a process, check out our blog post on Scrum methodology. 2. Do your team members have well-defined roles and responsibilities? Agile Scrum’s positive impact depends heavily on an empowered, independent team working together to get projects done quickly and efficiently. For that to happen, individual team members need to understand exactly what their roles and responsibilities are and how those roles and responsibilities relate to the project’s success. If team members don’t feel comfortable acting independently and owning their own pieces of the project, they will have difficulty completing work on time. However, when executed correctly, the independence that agile Scrum fosters can offer a huge advantage and inspire confidence in team members. 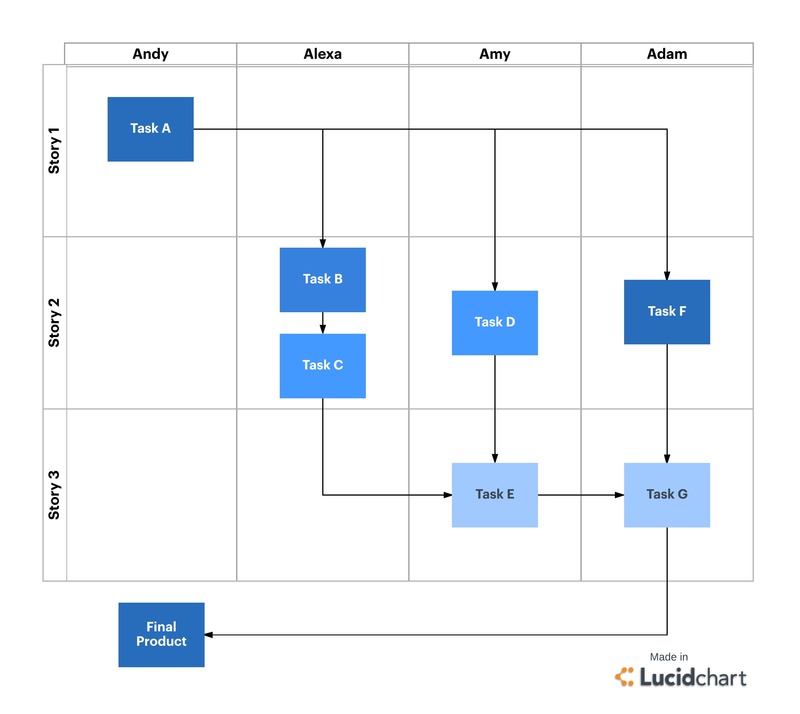 Before you dive into agile Scrum, you can use Lucidchart to visually outline each person’s role and responsibilities, and keep it as a reference for your entire team to eliminate confusion about accountability. As long as you clearly articulate why you’re adopting agile Scrum and how it will change the team’s process, you’ll equip your team to be invaluable contributors to the project’s success. 3. Will the agile Scrum methodology actually work for your industry? Agile Scrum is used by teams across a variety of industries. The methodology works well for smaller teams tackling projects with changing deliverables, unknown solutions, and frequent interaction with clients or end users. Thus, it is generally most effective for projects within software development, marketing, strategic planning, or supply chain silos. Sales, accounting, and purchasing divisions—which often deal with more static deliverables or established processes—aren’t as likely to find success with it. The main advantage of any agile methodology is the increased communication, both internally and externally, that occurs throughout the project’s lifespan. However, within agile Scrum, that communication can quickly become bothersome if it comes with a sense of urgency and stress. Be sure you’ve researched other effective agile methodologies alongside agile Scrum, or you may not see increased efficiency or other results you are after.. Consider Kanban, Lean, Extreme Programming (XP), or a completely different methodology until you find the one that fits your team. 4. Why are you considering agile Scrum? Adaptability: Agile Scrum projects involve frequent check-ins and updates, so if a project needs to change, it won’t languish for weeks before someone notices. You’ll be able to identify a problem or necessary change and pivot quickly without losing weeks of work. Plus, your project sees continuous improvement over its lifespan, rather than a few periods of big change. Visibility: Stakeholders have the option to see a project’s progress throughout its lifespan—not just at certain intervals around the beginning, middle, and end. They feel more involved, as does the entire team, giving everyone the opportunity to collaborate and watch the project move from start to finish. Efficiency: Any agile process aims to do more work, more efficiently, and if you and your team execute agile Scrum well, you’ll see those results. If you’re considering adopting agile Scrum, ask yourself the important questions above before you commit so you’re aware of key advantages and disadvantages from the start. In the United States alone, 122 million dollars are wasted for every billion invested in projects. While agile Scrum can’t guarantee your project’s financial viability, it can prevent wasted time and energy. 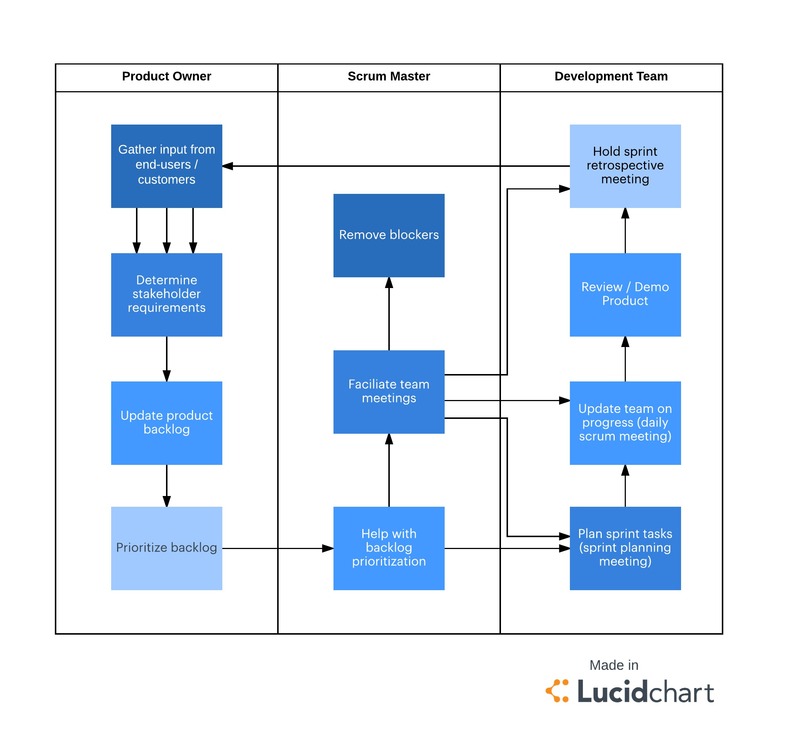 Prepare your team using the right tools from the start, including Lucidchart, and you’ll have every chance to improve results with agile Scrum.